Do Anti Aging Serums Really Work? As we get older, we’re always on the lookout for that miracle product that’s going to help us banish fine lines, wrinkles and age spots. Some of us spend way too much time lost in drugstore aisles or at department store skincare counters. But do anti-aging serums actually work? The short answer is yes–but the key is choosing the right product that’s going to target signs of aging below the surface. Is There a Difference Between Drugstore and MediSpa Products? Drugstore aisles are packed full of skincare products, and a lot of them make some dramatic claims. The big difference between drugstore skin care and what some experts call cosmeceuticals (the pharmaceutical-grade skin care products available at a medispa) is a list of key active ingredients, along with the concentration of those ingredients. Cosmeceutical producers have medical doctors, pharmacists and scientists on staff to develop cutting-edge products using the latest advancements in technology. Over the counter products often don’t have the key active ingredients that cosmeceuticals offer. And even if they have those miracle ingredients like Retinol and Vitamin C, the concentrations are often too small to be truly effective. Cosmeceuticals are designed to penetrate the outer layer of the skin so they can really get to work on correcting the underlying causes of wrinkles and other signs of aging. These high-end, high-tech products actually stimulate production of the collagen, elastin and new skin cells that keep skin looking young. The price tag is higher because of all the research and development involved, but it’s absolutely worth it. Another upside of shopping for skincare at the medispa is an experienced and trained staff to help you choose the regimen that’s right for you based on your age, sun exposure and skin care goals. 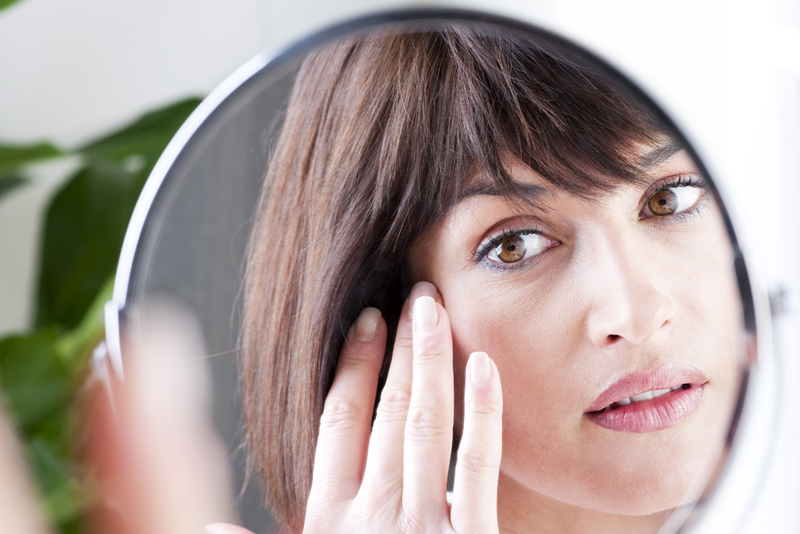 What Active Ingredients Should I Look For in an Anti-Aging Serum? Retinoids are Vitamin A-based chemical compounds that go below the skin’s top layer to boost skin cell production and function. Antioxidants help skin repair itself and make skin look brighter. Vitamin C is one of the most important antioxidants, not only boosting collagen production but also decreasing dark spots. Peptides are proteins that encourage your skin to create more collagen. Hyaluronic Acid is known for its incredible hydrating properties, replenishing your skin’s moisture and reducing fine lines. Alpha Hydroxy Acids are naturally occurring acids (often derived from fruits and other natural products) that can reduce signs of aging and increase the skin’s elasticity. Growth Factors are a hot new active ingredient that actually boost collagen and elastin production at the cellular level. They’re especially effective for sagging skin, so we love these for our more mature clients. Many of the best products combine several active ingredients, so we recommend talking with your esthetician about which mix is best for you. Our medical director along with our staff of trained nurses and estheticians have done loads of research and combined decades of experience to come up with the very best anti-aging products for our clients to take home. Two of our top brands for anti-aging serums are Innovative Skincare ( iS Clinical) and SkinMedica. With their commitment to both great science and real beauty, these top-notch companies are producing the best anti-aging products around. iS Clinical: Innovative Skincare’s GenxC Serum combines the company’s patented Extremozymes (a proprietary skin-protecting combination of enzymes) along with an exclusive Vitamin C compound that reduces the appearance of fine lines while brightening and firming skin. Another favorite is the iS Youth Serum, which brings in safe, natural growth factors to help reduce wrinkles long-term. SkinMedica’s claim to fame is leveraging your skin’s natural healing and reparative properties to make you look younger. Top products include the TNS Essential Serum including a powerful growth factor plus antioxidants and peptides. It’s the absolute best for mature and sun damaged skin. Other SkinMedica favorites are the HA5 Hyaluronic Acid based line and Retinol Complex. Every SkinMedica line has a target, and depending on your age and goals, we’ll help you choose the perfect serum for you. The in-spa anti-aging treatments at Radiance are the best in the area, with options for everything from wrinkles to age spots. Our clients usually want to follow up at home with the very best skincare products. We’ve chosen the skincare lines that we know will do the most for our clients, and our estheticians get to know you, your lifestyle and your skin and can recommend just the right products for you. And while the price tag is higher than what you’ll find in the drugstore, remember that with these high-quality products, a little goes a long way. And the unbelievable results are 100 percent worth it. Give the Gift of Radiance! Our gift cards can be purchased in any amount and make the perfect gift. Buy online or visit either of our locations to purchase and receive immediately. Receive specials available exclusively to our subscribers by signing up today. It’s easy and keeps you in the know on great deals and more. Do you know a stylist who should join the Radiance team? Tell them we pay up to 55% commission. And we'll thank you, too. Refer a Stylist to Radiance and you could be rewarded with up to $1000! If you're a stylist, you can refer yourself and collect the reward.